Gianluca Piccoli MD, Davide Zanuttini MD, Daisy Pavoni MD, Ugolino Livi Prof.
Paolo, D., et al. Obstructive Sleep Apnea in Heart Failure with Nearly Complete Resolution after Implantation of a Left Ventricular Assist Device. (2014) J Heart Cardiol 1(1): 4-5. ©2014 Paolo, D. This is an Open access article distributed under the terms of Creative Commons Attribution 4.0 International License. 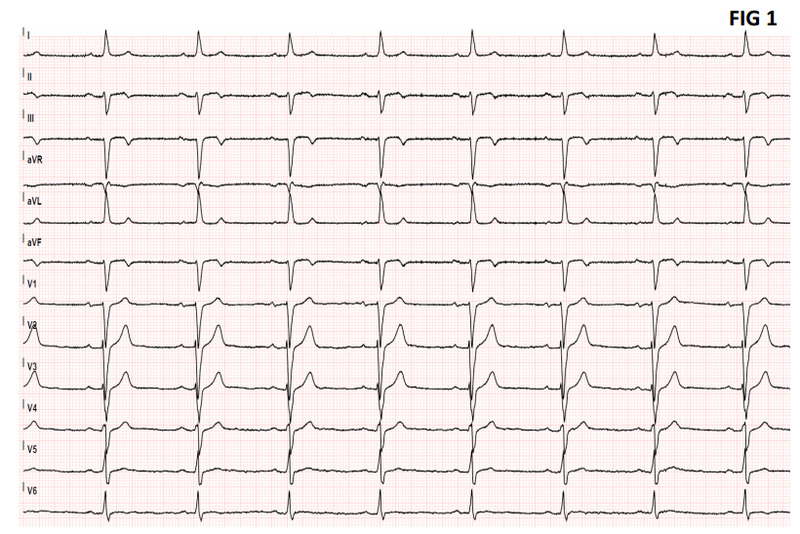 An 80 years old man was admitted 1 hour after the onset of chest pain with EKG suggestive for recent inferior myocardial infarction. Five days before the patient referred thoracic pain that spontaneously resolved after 3 hours. In emergency room in a peripheral hospital he was treated with Clopidogrel 600 mg. At arrival in our institution the patient was hemodynamically stable, thoracic pain was still present and arterial pressure was 105/60, EKG (electrocardiography) demonstrated sinus bradycardia 50 bpm and inverted T waves in D2, D3 and a FV leads (fiure 1). Cardiac angiography showed an occlusion of a poster-lateral branch (fiure 3A). Ventricular angiography revealed limited akinesia of the mid-inferior wall and a digit form out pouching of the ventricle at the same level (fiure 3B, 3C). 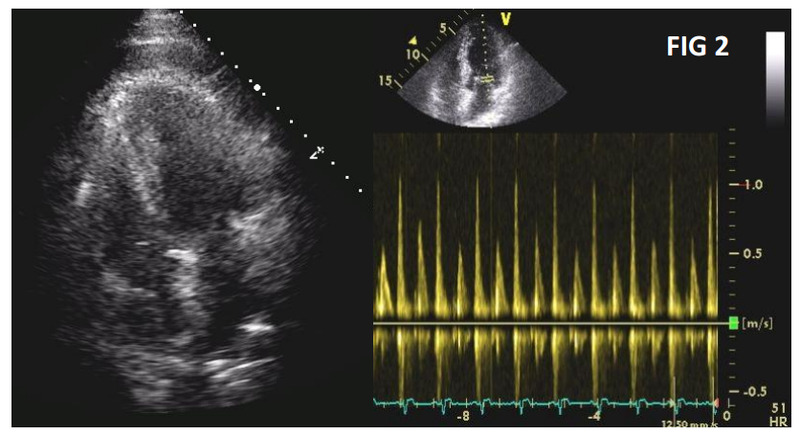 Cardiac echocardiography demonstrated mild pericardial clotted effusion with hyper echoic areas but it wasn't able to detect the direct communication between the left ventricle and the pericardial cavity, EF (Ejection Fraction) and FS (Fractional Shortening) were normal (74% and 59% respectively) and no sign of cardiac tamponade were detected (EDV 51 ml ESV 14 ml) (fiure 2). A 64 slice cardiac EKG gated CT (CCT) was performed confiming the trans mural tear in the inferior wall roofed by hematoma (fiure 3D & 3E). Owing to the stability of the patient and the high surgical risk we decided a conservative approach. CCT was repeated at 48 hours, showing a complete sealing of the myocardial tear (fiure 3F & 3G). The patient was discharged 1 week later in stable conditions. Myocardial rupture is an uncommon complication of myocardial infarction in the era of primary PCI (percutaneous coronary intervention). Free wall rupture is usually fatal, while septal wall rupture often leads to catastrophic hemodynamics consequences. When patients do survive, urgent surgery is the treatment of choice. However, a conservative therapeutic approach has also been described in selected patients with free wall rupture. The criteria used to guide the decision are usually clinical or echocardiographic; however in most cases US (ultrasound) are not able to visualize the tear directly. Due to the good spatial resolution and panoramic fild of view, cardiac CT is able to visualize the rupture and to quantify the transmural extension; these data are important to support clinical decision. In our case the 48 hours cardiac CT at 48 hours showed the complete sealing of the tear and allowed a safe early discharge of the patient from ICU (intensive care unit). In 2003 other authors reported a similar role for cardiac magnetic resonance that was able to predict the impending rupture of an inferior infarction on the basis of an hemorrhagic myocardic area. CCT can be proposed in the diagnosis and follow up of post-infarction cardiac wall rupture in order to guide clinical decision and keep safer a non surgical management. 1. 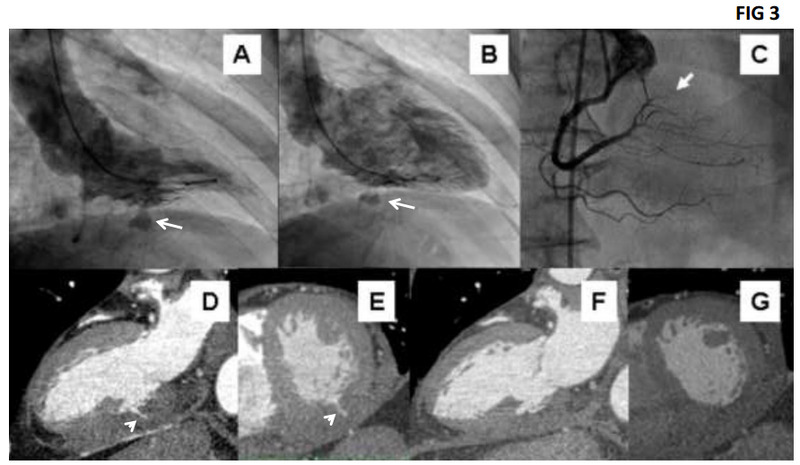 Myocardial free wall rupture is usually fatal but when the patient survives, in selected cases, a conservative therapeutic approach can be proposed. Disclosure Statement: All the authors disclose any conflict of interests and disclose any economic relationship with the pharmaceutical industry inherent the topic of the paper. 1. Haddadin, S., Milano, A.D., Faggian, G., et al. Surgical Treatment of Postinfarction Left Ventricular Free Wall Rupture. (2009) J Card Surg 24: 624-631. 2. Figueras, J., Cortadellas, J., Soler-Soler, J. Left ventricular free wall rupture: Clinical presentation and management. (2000) Heart 83: 499-504. 3. Zoni, A., Arisi, A., Corradi, D., et al. Images in cardiovascular medicine. Magnetic resonance imaging of impending left ventricular rupture after acute myocardial infarction. (2003) Circulation 108: 498-499.